IBPS PO Prelims is in its way and lot of aspirants are heading towards new hopes with this upcoming opportunity. Thus, English Language can be an impetus for their success by saving time and scoring well. So, instead of boiling the ocean, try building up a strong vocabulary, an effective knowledge of grammar, and efficient comprehension skills so as to be on the ball to face this particular section. 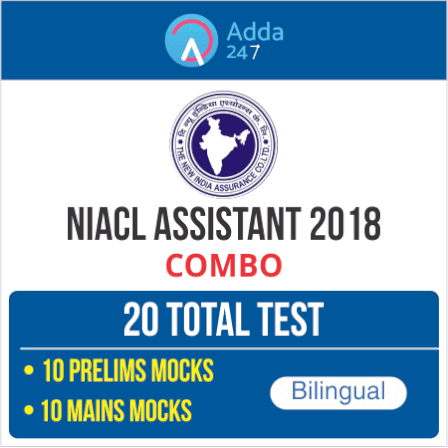 Here is a quiz on English Language being provided by Adda247 to let you practice the best of latest pattern English Questions for upcoming IBPS PO exam. Directions (1-5): Fill up the blanks by choosing the appropriate alternative out of five given below each question. Q1. Another __________ of caricatures of the football icons done by a group of cartoonists and caricaturists from across the State too was on at Press Club. 'exhibition' as there is an event happened in the past which has been talked about in the context, which reflects that there must be an exhibition of caricatures happened at the press club. Q2. The result kept India __________ in the five-match series after heavy losses in the first two Tests in Birmingham and London respectively. 'alive' is the alternative out of five which fits into the blank as the context talks about the post effects of heavy losses on India which are still hopeful .i.e. after such losses, India kept itself alive. Q3. Rather it seems that structural alterations in neuronal morphology and synaptic connections are features most consistently __________ with brain age, and may be considered as the potential physical basis for the age-related decline. 'correlated' because the context of the given sentence talks about the neuronal morphology and synaptic connections features which are correlated or connected with the brain's age. Q4. Meera, the mystic Krishna bhakt’s appeal spans across the country. A dance drama on her life and poems has been given form beautifully by two __________ Carnatic artists Padmashri Chitra Visveswaran and Vidushi Bombay Jayashri. 'leading' is the only word which is associated with the word 'artists'. If we talk in the context of the word 'artist', we can say that they are the 'leading' one. Q5. In one poem, there would be perhaps two words that could be tapped to highlight a critical ___________ in her spiritual journey. It is a production focusing on Saint Meera, not Meera the person. 'juncture' means a particular point in events or time. Here, we are talking about the life journey of Meera in which a critical juncture of her life journey has been tapped and discussed in the context. Directions (6-10): Choose the correct alternative out of five in each question to fill up the blanks and complete the passage. In July, a two member team of chemists, Anshu Pandey and Devesh Kumar Thapa, __(6)__ a preprint on the arXiv server claiming to have __(7)__ superconductivity at ambient temperature and pressure in samples in their lab in the Solid State and Structural Chemistry Unit at Indian Institute of Science, Bengaluru. They had studied materials with silver nanoparticles __(8)__ in a gold matrix and found that their samples showed the signs of becoming a superconductor on cooling below 236 K (-37 degrees Celsius). Further, when they __(9)__ the mole fraction of gold in the samples, they could __(10)__ the critical temperature Tc (the temperature at which the transition to superconductivity happens) up to room temperature. 'posted' is the only the alternative which fits into the context as the team of two members posted a preprint. Preprint here referred to as a display of facts analyzed through or self-prepared by a person or group of persons. 'observed' as the team of two members observed superconductivity at ambient temperature and pressure in samples in their lab in the Solid State and Structural Chemistry Unit at Indian Institute of Science, Bengaluru. 'embedded' means fix (an object) firmly and deeply in a surrounding mass. Here, the persons who are studying the particles has studied materials with silver nanoparticles embedded in a gold matrix. 'altered' means make structural changes to something. The observers altered the mole particles of the gold matrix to study it further. Directions (11-15): Rearrange the following sentences (A),(B),(C), (D) & (E) and answer the questions given below. (A) Also, as part of the bailout conditions Greece will need to maintain a 3.5% primary surplus (a budget surplus prior to interest payments) until 2022 and then around 2% until 2060. The IMF has warned that such budget surpluses are rare. (B) There are concerns that they will constrain Greece’s ability to grow and pay off its debt. (C) It is especially challenging for a country that has just emerged from a decade of economic strife and austerity and has an ageing population. (D) Yet the path is far from clear and the road is long. Greece owes a staggering 180% of GDP in debt. (E) The economy shrunk by a quarter, unemployment was at 28% (50% for those under 25 years of age), government spending was slashed as were salaries and pensions, hundreds of thousands of Greeks emigrated and a third of the country fell into poverty. Q11. Which of the following will be the THIRD sentence after the rearrangement? Q12. Which of the following will be the FOURTH sentence after the rearrangement? Q13. Which of the following will be the SECOND sentence after the rearrangement? Q14. Which of the following will be the FIRST sentence after the rearrangement? Q15. Which of the following will be the FIFTH sentence after the rearrangement?